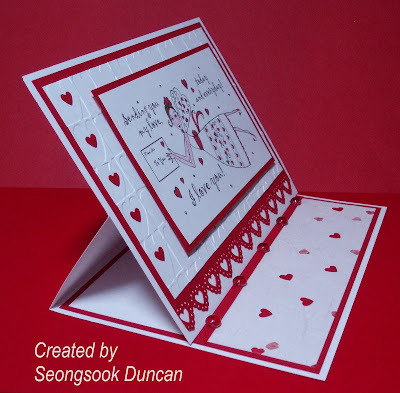 This card is for OWH S&S Sketch Challenge #6 provided by Velda. 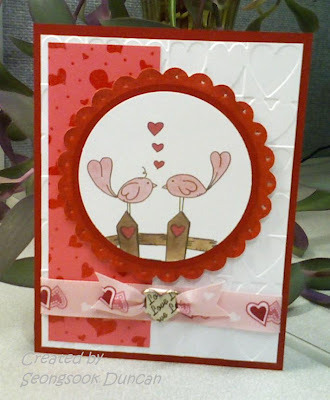 It is a great sketch to create any theme of cards. Thanks to Velda! 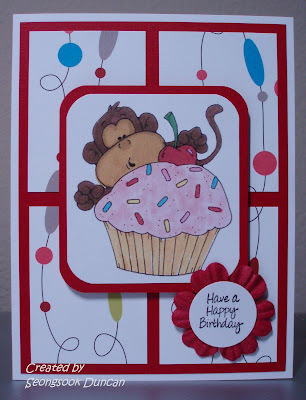 I used a digital image Cupcake Monkey from Dustin Pike. 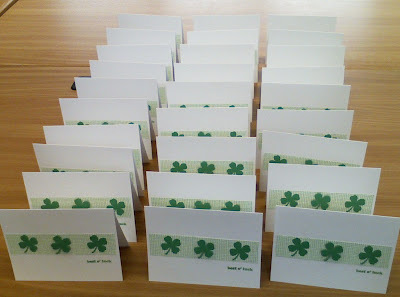 I've been busy getting ready to ship 100 cards for OWH. 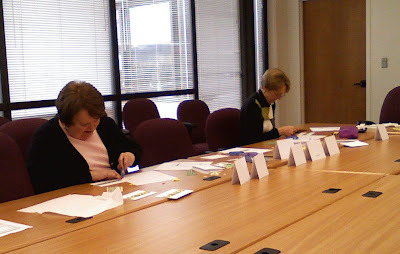 Thanks to my fellow cardmakers at work who assembled these cards with me. 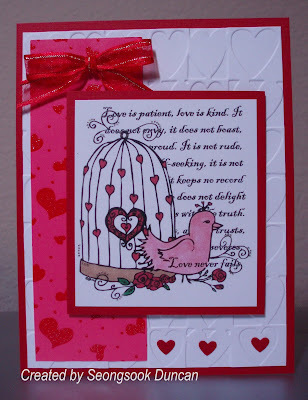 * Fred She Said Challenge: February 22 Challenge - create something with at least 3 hearts on it by using Fred She Said Digital Stamps. I used one of the colored version of Rosey with flower. 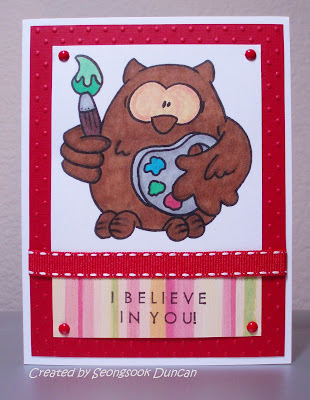 I love Jennifer McGuire's inspiring creations and her friendly tutorials. Here is a link to her a video full of ideas for you today. I hope you will get inspired, too. 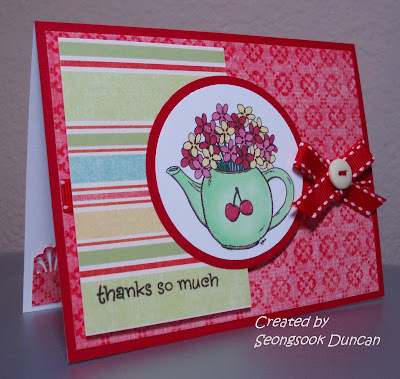 * Delightful Inspiration - Final FREEBIE for February! 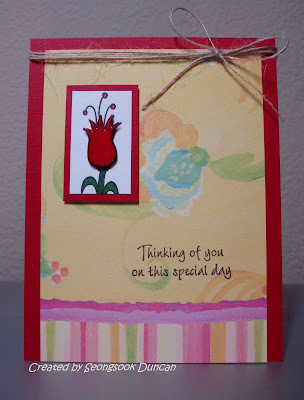 * Cute Card Thursday Challenge 101 - Ribbon - Tastic! 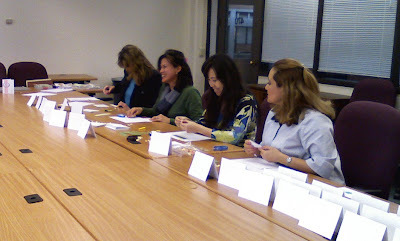 I made these bookmarks for Card Maker Swap. It is 2" x 6" size. First I sprayed card stock with Glimmer Mist: Lemon Zest, Denim Blue, Meadow Green and Rum Raisin to create dreamy color to match the "Dream" digital image from Michelle Perkett Studio. I used Glimmer Screens to create the background design. For the backside, I made my own rub on. 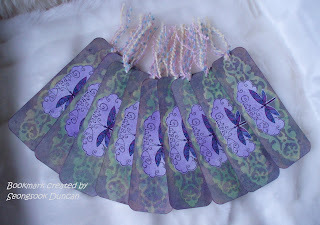 I am not satisfied with the result of this trial on these beautifully (my wishful thinking) made bookmarks however, it was an experiment and I learned how to make it better next time. I printed the quote "The future belongs to those who believe in the beauty of their dreams. ~ Eleanor Roosevelt" on a transparency paper. I set the printer setting as "mirror image" to print it backwards. I waited but it didn't dry for long so I tried to dry it with my heat gun very quickly. I rubbed the quote on the backside of bookmark as I did with other rub ons. It worked!!! My sister asked me to make a thank you card for some parents who took her younger son to a Piano concert. I had this wavy music notes stamp and wanted to use it one day. It was perfect time to play with it. 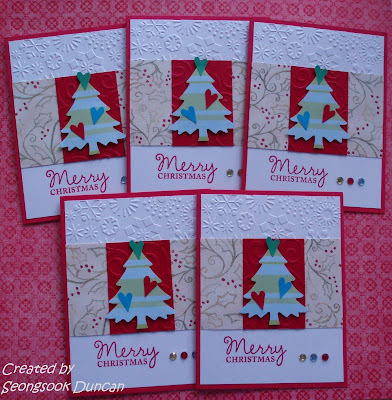 I stamped it several times on the black paper with embossing stamp pad and heat embossed with silver embossing powder. For the focal image and the sentiment as per David's suggestion, I stamped them with Versafine Onyx Black ink pad and embossed with clear embossing powder. It turned out very well and my sister liked it very much. 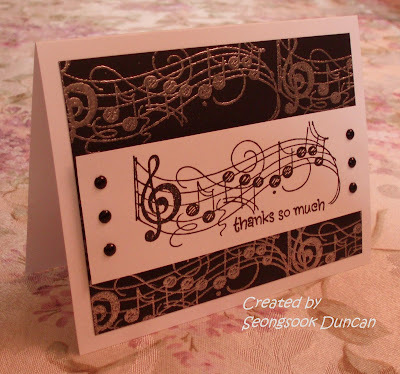 Rubber Stamp: Wavy Music from Stampendous! Yaho~ I used my first Nestabilities set for this card. It is great. This clean and simple card is for OWH S&S Technique Challenge 01: Heat it Up. 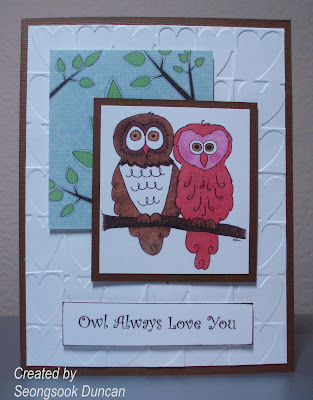 I stamped the focal image with purple pigment ink and embossed it with clear embossing powder. 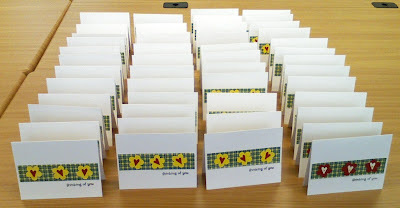 I made this card at the last minute this morning for one of my colleagues who got married recently. I took a photo with my cell phone and it still turned out very well. 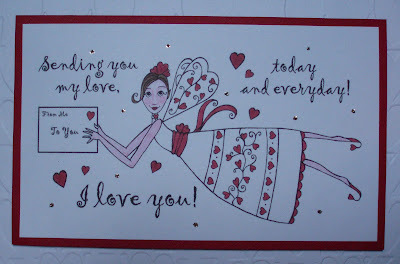 Thanks for stopping by my blog over the Michelle Perkett Love Letter Bloghop on Sunday, Feb. 7, 2010. It was so impressive and touching. I will send a PM on PCP to each winner. 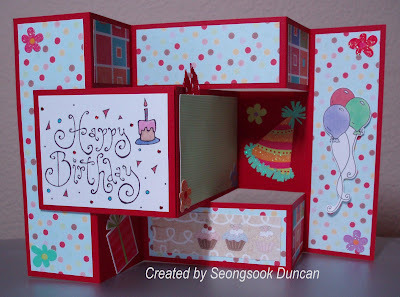 Finally I made this card for Delightful Inspiration Artist's challenge . It took me a while to get a feeling of the saying that Owl sounds like I'll. Hope my guess is right. Well... something to learn everyday. I think this can be a nice masculine card that I can send to our heroes. I colored the image with Bic Mark it and printed out the sentiment from my computer. 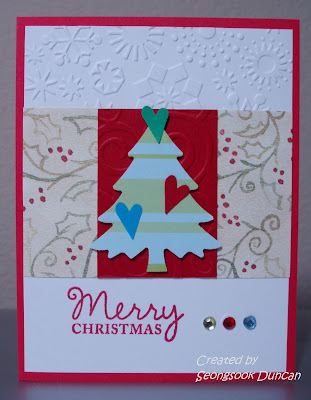 This card is also for Mercy's Tuesday Sketch Challenge #59. 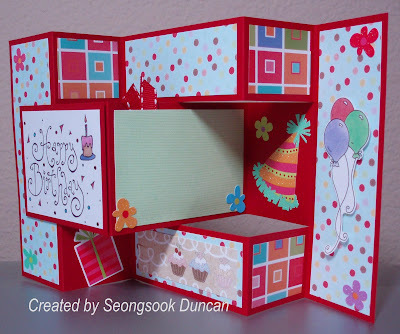 This morning, I read a post about the Trifold Shutter Card Tutorial at the OWH Stars and Stamps Blog. What a great tutorial! It is open for two weeks to give you time to figure out this challenging card. I made this card with an idea that came up to my mind while I was reading one of comments that questioning how can soldiers write their message on this card. 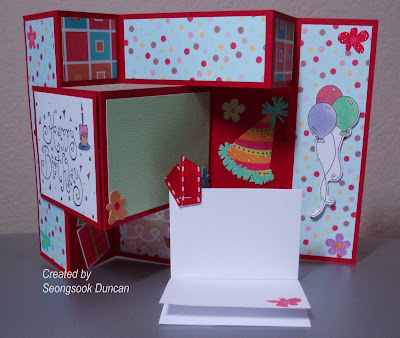 This is a close up of the middle panel of the card. Not only this blank space but also I made it as a pocket and inserted a paper inside for wrting more messages. I put the ribbon at the top left of the inside paper to make it easier to pull it out. 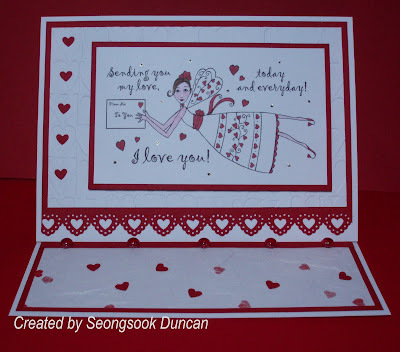 I made this card for Valentine's Day Card Exchange based on the OWH Stars and Stamps Sketch Challenge #2 with the digital image "Love Collage" from the Designed 2 Delights.